"Face to Face with Future Generation"
The deadline for submission is January 15, 2016. Essay topics must be chosen from the 15 global challenges outlined in the Millennium Project. For the purpose of determining finalists and winners, each challenge will be judged separately. 1) Essay on chosen challenge must address problems in Azerbaijan and analyze them within the global framework. 2) Title must reflect essay content. 3) Problems and proposed solutions must be expressed clearly. 4) Essay should be 3-5 pages for high school students, 5-7 pages for student of universities (bachelor) printed in Microsoft Word 12 point type. Handwritten works are not acceptable. Your work can be in Azerbaijani, Russian or English. 5) Respecting copyright and citing references are important. How can decisionmaking be enhanced by integrating improved global foresight during unprecedented accelerating change? 1) Contestants must base essays on their own views. 2) Instruction Appendix to the chosen global challenge: It is important to get acquainted with the description of the challenge. 3) Cited literature and materials must reflect todays problems. 4) Using internet and other resources are advisable. 5) Teachers should provide consultation to students prior to writing. 1) All works will be judged by experts. 3) The following factors are considered during the evaluation. Authors of the essays honored with the 1st, 2nd and 3rd places on each challenge therefore 90 persons (45 persons high school students and 45 persons students of universities) will be considered finalists of the contest and will be awarded. Essays of the finalists will be sent for participating in the Global Millennium Prize Award Ceremony whichs held in Mexico every year. All winners and finalists will be represented with corresponding certificates. The essays of all winners will be published as Summary and will be distributed to the participants of the Award Ceremony. 1) The deadline for submission is January 15, 2016. 2) Essay must be submitted in typed form (computer disc can be attached) with the authors information included. © 2o1o. 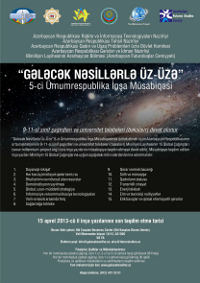 Azerbaijan Future Studies Society.